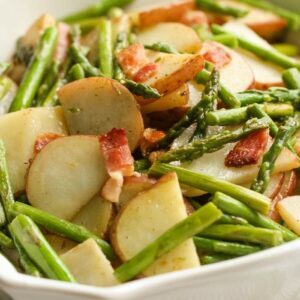 One of our favorite side dishes - Asparagus Tater toss with bacon! In a saute pan over medium-high heat, add the bacon and cook until crisp. Remove with a slotted spoon to a plate. Add the butter to the remaining bacon fat and add the potato slices. Sprinkle with salt and pepper. Saute until crisp on one side, and then toss and cook on the other side until crispy. Add the garlic and asparagus. Season again gently with salt. Continuously toss until the asparagus are bright green and tender, but still crunchy, about 3 minutes. Sprinkle the lemon juice over top. Toss in the reserved bacon and serve warm.